In conjunction with the Great Sphinx, the nearby pyramids were an obvious highlight in our trip to Egypt. 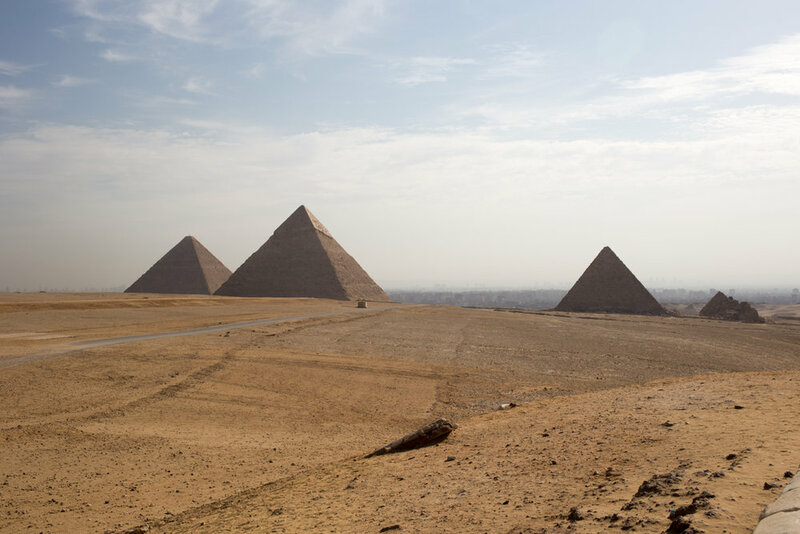 The Giza Plateau is the only place in the world where you can still find a Wonder of the Ancient World—of the seven original wonders, the Great Pyramid of Khufu is the only one that remains. 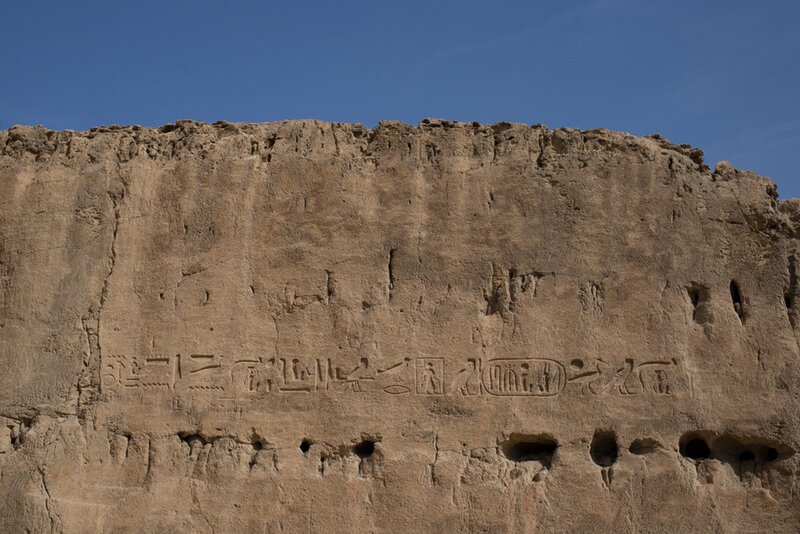 The plateau actually contains six pyramids—the three most famous ones plus three smaller subsidiary pyramids—a workers’ village, quarries and several cemeteries. The three largest pyramids were built by three generations of pharaohs—a grandfather, father and son. The largest and oldest, The Great Pyramid (also known as the Pyramid of Khufu or the Pyramid of Cheops) was built during the Fourth Dynasty between 2580 and 2560 BCE. 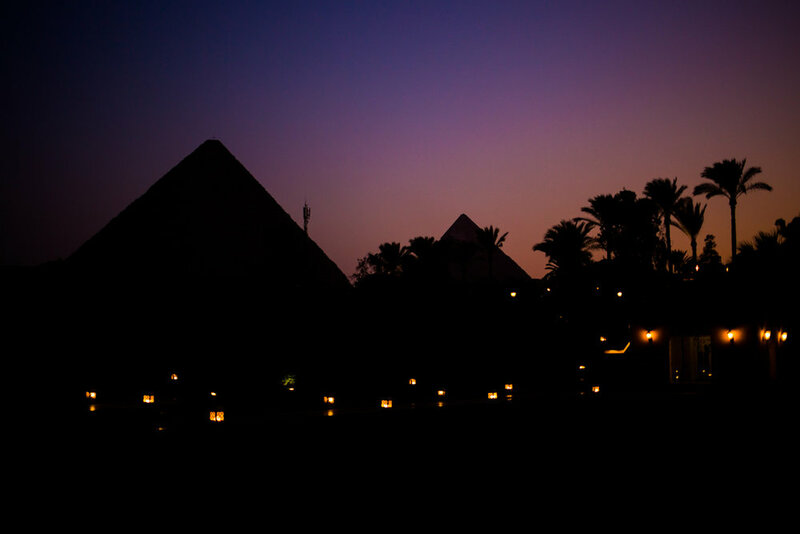 It is the oldest of the Seven Wonders, and it was constructed for the pharaoh Khufu. It was originally 481 feet, but now due to erosion and the absence of its casing stones, it measures 455 feet (a rod placed at the top shows its original height). It’s a common misconception that slave laborers built the pyramids. The more than two-million blocks—used to build the Great Pyramid alone—were actually quarried and transported by tens of thousands of skilled (and paid) workers, whose village and tombs were discovered nearby. The limestone building blocks were cut from nearby quarries, the Tura limestone casing stones were quarried across the Nile and the granite used to build the interior chambers was transported from Aswan. The Great Pyramid is the only of the three that you can currently enter, and it contains three known chambers. I actually entered the pyramid with the rest of our group, but had second thoughts when the corridors began to narrow, so I turned back. It’s impossibly hot and airless inside, and the low ceilings and tight spaces are a claustrophobic nightmare. The King’s Chamber and Queen’s Chamber are connected by the Grand Gallery, and from what I heard they are mostly empty and lack the colorful inscriptions of other tombs. 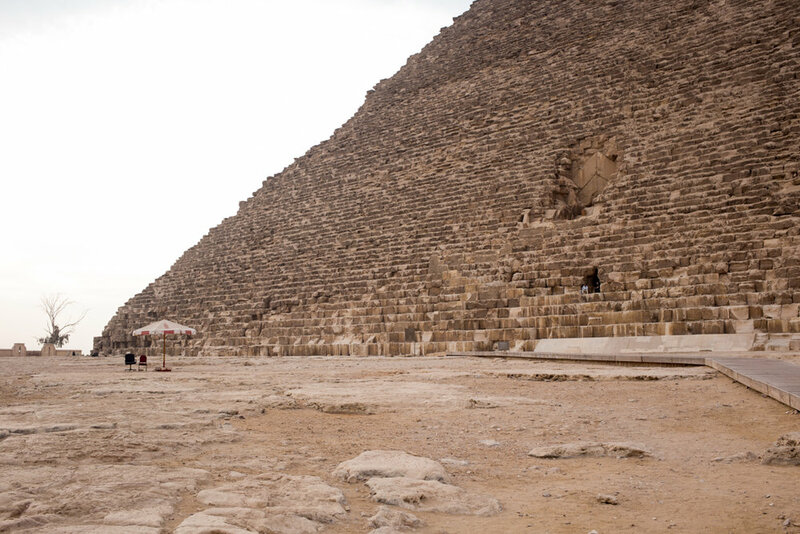 The second-largest pyramid, the Pyramid of Khafre, is my favorite of the three because it still contains portions of its original limestone casing stones. What an incredible sight it must have been to see all three pyramids as they were originally designed, polished and bright white, gleaming in the sun. 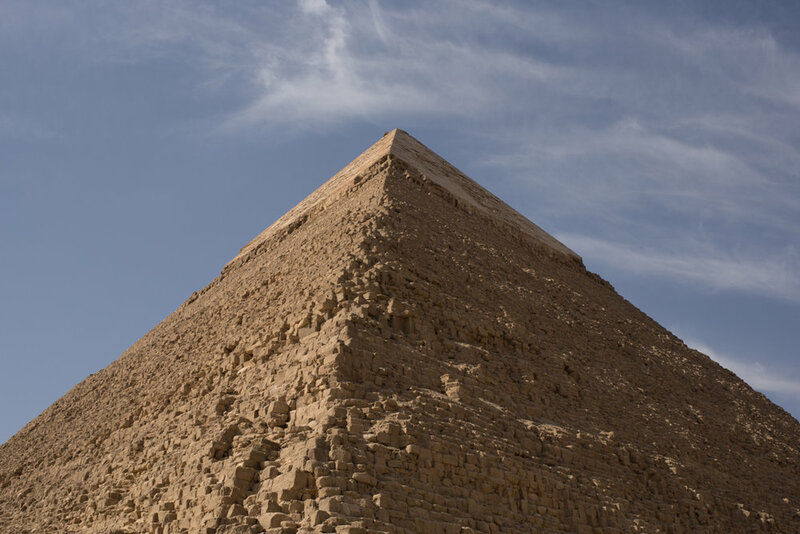 The Pyramid of Khafre was originally 471 feet tall and now stands at 448 feet, but because it’s built on slightly higher ground, it looks to be about the same size as the Great Pyramid. The third, and smallest pyramid is the Pyramid of Menkaure, son of Khafre and grandson of Khufu. Constructed in 2510 BCE, the 213-feet-tall pyramid would be impressive on its own but it is dwarfed by its two more famous neighbors. The Giza Solar Boat museum was built in 1985 at the base of the Great Pyramid to house Khufu’s reconstructed solar ship. The ship was rediscovered in 1954 buried in a pit near the pyramids. It is one of the oldest, largest, and best-preserved ships from antiquity. Found in 1224 small pieces, the 143’ long, 19.5’ wide ship took years to reassemble. We were lucky enough to have special early-morning access to the Giza Plateau, and we basically had the entire complex to ourselves for a blissful hour before the hordes of tourists began arriving. On the last day of our trip, we stayed at the Mena House in Cairo, and even after all of the other magnificent temples and tombs we saw along the way, a view of the pyramids still managed to thrill. They are just so massive and otherworldly that photos will never be able to truly convey the feeling you get while standing in their great shadows.